Let us handle your application’s reporting. Install and start designing your own templates in a matter of minutes! 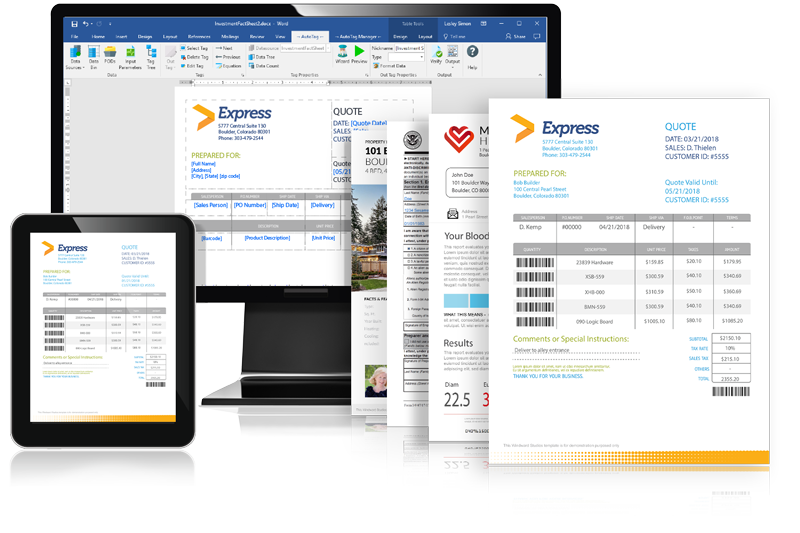 Data-powered documents at your fingertips in just a fraction of the time. Enter your info and we’ll immediately email you a trial key. The trial has all features enabled – you can try everything. Forms, Proposals, Statements, Reports, Contracts, Invoices, Surveys, Quotes, Presentations! Reporting for high-volume output and a user-friendly design environment embedded in your application. Fill out our trial form, and install the Windward trial download into your Microsoft Office as an add-in. Connect your template to a datasource and start creating your 'Smart Documents'. Test your required output: PDF, DOCX, XLSX, PPTX, HTML, CSV, GIF, and more!